For the next two weeks we are staying at Hillsdale State Park in Kansas. The sites have fresh water and 30amp power but for the first time we will be without a sewer hookup for more than a couple of days. The glamour ends here . . .
We generally need to empty the black tank every 4 – 5 days. I suppose we could hitch up and tow the trailer over to the dump station every 5 days. But the grey tank needs to be emptied daily with our normal routine. Most parks, including this one, do not allow grey water to be dumped on the ground – a topic widely debated in the RV community. Moving the trailer daily would be a chore so we bought a 35 gallon Thetford Smartote to get the waste water from a > b without moving the trailer. The tote (we call it a “blue boy”) can be towed behind a vehicle at a top speed of 5mph. The park’s dump station is a mile away. That would mean a 10 – 15 minute drive. Enough for a repeat of “Purple Rain” to be sure but I wouldn’t bet on the tote’s wheels lasting very long. The only method I could find to deal with this problem is to leave the blue boy in the truck bed and use a macerator pump to defy gravity and transfer the waste water into it. What could go wrong? After a few minor tweaks it works as well as something like this could work. I wish it were prettier. I haven’t figured out how to manage all the components with a reasonable degree of cleanliness since the pump is not permanently installed. So we won’t be using this to dump black water. For now we will move the trailer every 5 days to dump the black. Thetford Sani-Con Tank Buddy with 21′ retractable hose. This is the macerator pump. Clearview 5″ Sewer Adaptor with Bayonet Lugs. Rotating Grey Water Bayonet Fitting. 1/2 – 1-1/4″ hose repair clamp. 12v lawn mower battery (couldn’t find a link on Home Depot but I bought mine from there). 21′ retractable hose + 1/2 – 1-1/4″ hose repair clamp > Rotating Grey Water Bayonet Fitting + Plumbers’ tape > Clearview 5″ Sewer Adaptor with Bayonet Lugs > Thetford Smartote. A lot of junk helps. Notice the spray can of silicon lubricant – this is good for helping the plastic connectors twist together and apart. Thetford Smartote > Clearview 5″ Sewer Adaptor with Bayonet Lugs > Double Pin Termination Adaptor > sewer hose. Spring is here and in Kansas that means Winter is nearly over. This entry captures what we learned and shared in the 14 posts we wrote about being cold in the Winter of 2013. Move to the warmest place you can. If you can get above 32 degrees you don’t need to read any further. This is our go-forward plan. You should skirt if temperatures are going to drop to single digits or below for several days. Otherwise interior water lines will freeze under the floor. In the 28′ International this will first manifest in the bathroom. 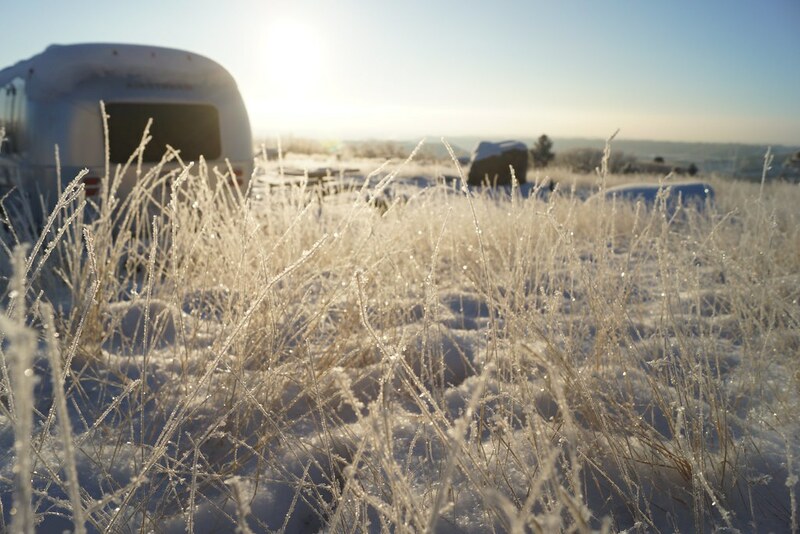 We found skirting raised the temperature under the Airstream by about 40 degrees. The furnace will keep the interior warm and at -15F we consumed a 30lb tank a day. For this reason we bought a 20lb back up tank to use when filling the other two. This removed the anxiety about running out of propane. Leave cabinet doors open when you can. The furnace will not keep holding tanks from freezing when temperatures remain in the 20s or below for several days. The only solution is skirting. The emergency tank thawing procedure is as follows: set up a hairdryer pointed at the drain; pour an enormous amount of salty boiling water down the toilet. This procedure may take hours. Inbound shore water can be kept flowing fairly easily. This requires a heated hose and insulating the faucet. We recommend the Piret heated hose. Insulating the faucet means wrapping it in heat tape and insulation and then covering it with something waterproof since insulation is ineffective when wet. We simply placed a trash bag over the whole thing. Waste water sitting in exposed drain pipes will freeze without skirting. This is biggest single problem with a three season trailer. The grey water valve can be left open provided the sewer hose has a nice uninterrupted incline to the sewer. Ensure there are no bends in the sewer hose run where water could stand and freeze. We did not insulate our sewer hose but if you are in one place for weeks at a time this might be a reasonable level of effort. For the black water the only thing you can try is a lot of RV anti-freeze, hoping it will settle in the exposed pipes since it is denser than water. 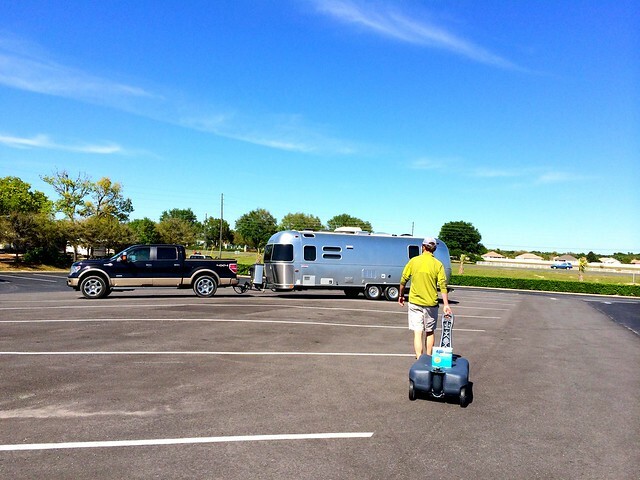 This is an official recommendation from Airstream. Our experience showed this to be ineffective and every black water dump was an exercise (sometimes hours) with a heat gun/hair dryer to thaw the exposed pipe. In fact our bottles of -50F RV anti-freeze actually froze solid at one point. Skirting makes this problem go away. We strongly recommend both an electric blanket and an oil-filled electric radiator to supplement propane. If you are on 30amp power you must turn off the radiator when using a hair dryer. Do not tow in snow or ice. Snow is better than ice. Travel with your fresh water tank full. You never know whether water will be available at your destination. This is an all-season rule.